The Mobile Museum serve more than 15,000 students every year all over 33 counties in New Mexico. The grant-supported program aim to focus on little children in elementary schools especially those in remote and rural communities. They are the ones who need all the help they can get since they have little or no access to museums. The Van of Enchantment also target schools that has the least engaged and inactive students. 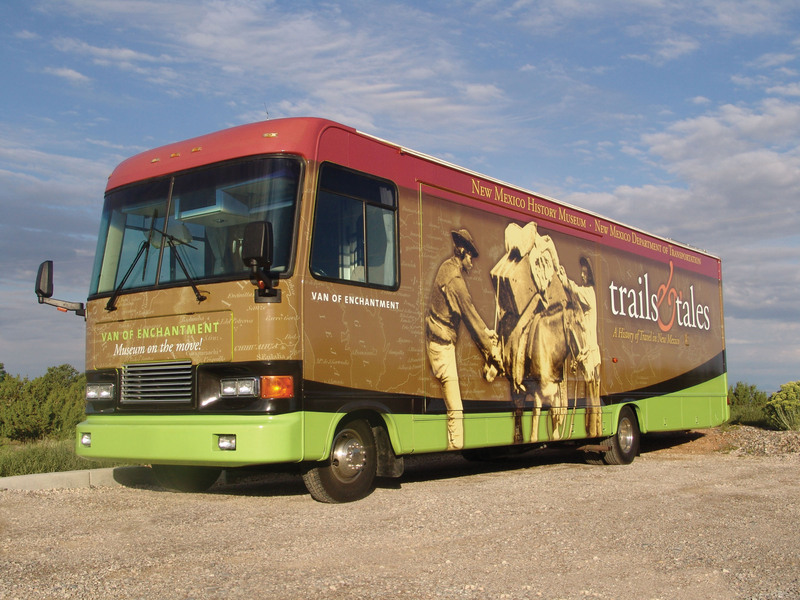 The Mobile Museum is a vital link between New Mexicans everywhere and the resources and educational opportunities offered by New Mexico’s Department of Cultural Affairs. Immersion in the arts and developing a connection with it will help participants to improve their cognitive ability and critical thinking. It makes the mind active so that students can work on math problems and boost their verbal skills. Furthermore, learning arts increase inspiration, awareness, self-reliance, and communication. A new study published in the American Academy of Ophthalmology suggests that medical students who studied art observation became better clinical observers and became more tolerant towards others’ opinions. “The Van of Enchantment’s outreach mission is to promote public awareness of the role of the State of New Mexico’s museums and monuments as stewards of the state’s cultural heritage, and to create an ongoing relationship between the state museums and monuments with the people of New Mexico. The mission is maintained and nourished through a number of actions, including collaboration and partnership with Department of Cultural Affairs and other state and community agencies, traveling to each of the 33 counties of the State of New Mexico with one or more outreach programs, gathering cultural information from New Mexicans through outreach activities, and maintain an interactive and informative website that encourages return visits on a regular basis. Take those unengaged, underserved communities through an interactive learning experiences where they can learn about cultural differences and scientific disciplines. Make available the valuable educational material of NM’s state museums and historic sites statewide. Inspire and ignite a love for knowledge. Bring a fresh, new perspective to rural populations through museum exhibits at no cost. Which teach them about their true heritage and encourage them to keep curious about the world around them. Plant the seeds of appreciation for museums and historic sites in their minds. Make them value their culture and traditions. Expand upon standards-based education activities for school children making use of the wide collections of DCA museums. How the Van of Enchantment is funded? In 2010, the van served 20,655 guests around 13,770 were children. Two educators/drivers manage the van; they take care of designing & fabricating a new exhibition in the van each year. Mann, a contractor, runs the program; and Jamie Brytowski, a full-time state employee, is the lead educator. Four part-time educators take turns joining Jamie on the van, each working 100-200 hours a year. The costs of running the van are around $221k/year, which is a cost of $10.71 per visitor. The van’s journey started in 1996 and had received many grants over the years from various institutions. Sometimes, the van visits fewer sites when the funding is small during lean years. The History Museum provide the artifacts. The Van of Enchantment has changed many lives, and continue to change lives with each travel. Support the State of New Mexico today. How Mobile Museums Came to Being? A prosperous Pueblo community in the 13th century. Spanish conquistadors and colonists in the 16th century. Railroads in the twilight of the 19th century. Museums have always been the powerhouse of history; they are not just storehouses for artifacts and rare objects. Furthermore, museums and exhibits are not just for the literary intellectuals; they belong to all the people. Unfortunately, not every student can visit a museum even if he or she wanted to, be it for financial reasons or long distance. That’s how the idea of movable museums was born. The educational role that museums play is second only to libraries, the idea of movable museums came from the idea of movable libraries. In Victorian England, there was a need to take educational material out of libraries to reach underserved communities. Can you imagine a better way to reach underserved audiences than to go where they are? Whether in Recreational Vehicles (RVs) or trucks/trailers, mobile museums are helping spread the word. Teaching the people history, science, and art. Offering great experiences for all participants. What is Van of Enchantment? 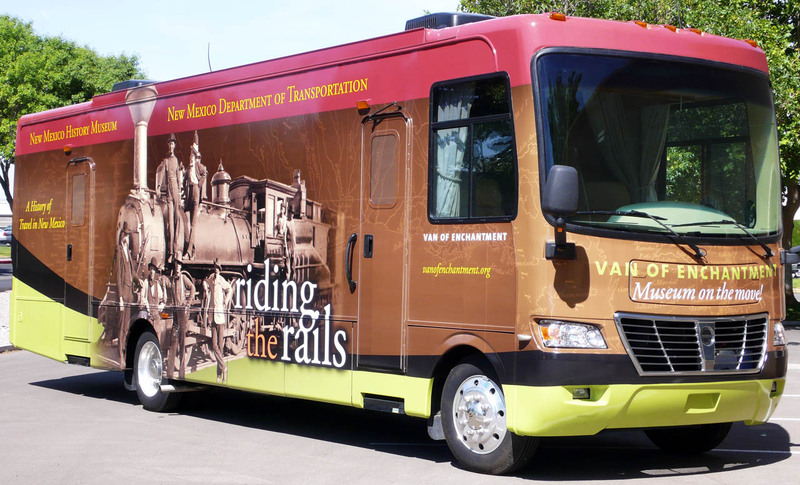 In its purest form, Van of Enchantment is a mobile museum started by New Mexico’s Department of Cultural Affairs’ (DCA). The goal is to spread arts, culture, history, and science. The 300 square feet RV travels New Mexico carrying wisely curated exhibits to remote, underserved and under-resourced public schools (usually places with residents who have poor credit). It’s a truly enriching experience for the students who don’t have access to DCA museums and historic sites. Students can get to learn about the history of New Mexico through an engaging way they can’t access in any other way.